California de Besilu’s dam is Pecadora de Besilu who is sired by one of the most sought after internationally recognized breeding stallions, Dulce Sueño de Lusitania. Dulce Sueño has been awarded in Colombia the prestigious title of “Jefe de la Raza” (Sire of Sires) continuously from 2010-2017 and appeared on the PFHA’s Top Ten Sires list for 2017. Equally as important as her sire is Pecadora’s dam Pecadora de Yerbabuena who is a very well known Grand World Champion Fino Mare in Colombia. 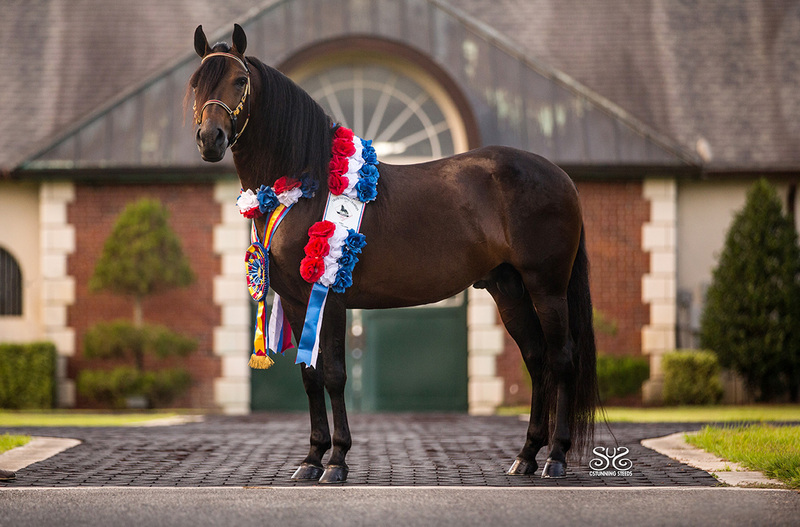 California’s sire Barullo de La Alqueria is a Handsome, tall, Black Classic Fino stallion that has Natural collection, exceptional mechanics and brio. California inherited his distinct upright carriage. California has presence and unmistakable power in her movement. With continued training she is clearly a candidate for the show ring. Her incredible pedigree, energetic nature and strong mechanics make her a fantastic option for breeding! Matched with the right stud, she could make a truly extraordinary foal.